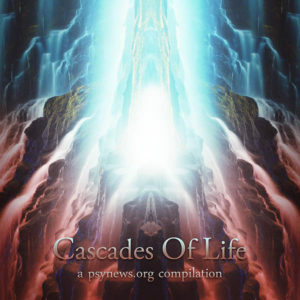 Psynews.org, one of the oldest and biggest Goa and psytrance sites in the world, is proud to present Cascades Of Life, the culmination of their latest contest. Submitted and voted by the community, this compilation combines the talent of both new and veteran artists with the passion of Psynews members for good music. Ranging from morning sounds to darker sci-fi themes, these lovely made tracks will speak to every Goa and psytrance lover. Dedicated to Nemo Zimmer, a friend and once moderator of Psynews.org, who sadly passed away this year. Mastered by Deimos with artwork by Gasolin3. MP3 Download | FLAC Download | WAV Download · Download count: 16,118. Sweet. Just what I’ve been looking for to go with run race training. Thanks psynews.org and Basilisk. This release is pure dope! Thanks all the artists, especially thanks to psynews.org to make this real! Nice promotion for and by PsyNews.org! It is becoming the first go-to website for good releases and for general hangout of psyheads. Go visit it and support the community, y’all! Great compilation. I love to see Cybernetika and Xenofish there. Btw, whatever happened with their co-produced album? Last I heard was that it’s mainly ready, only needs some finishing, but that was like two years ago. Yes , Awesome Album especially track 08 (Prismatic Reflection) also track 09 (Made Out Of Stars). What latest news about Xenofish & about Xenofish feat Shivaxi also No Turning Back!? Profetia – in my opinion the best track in this compilation. Magical! I’m agree! Profetia is the best track. Buenisimo! lo escucho una y otra vez y me encanta, gracias!